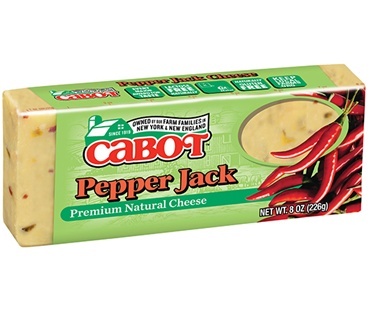 Jalapeno picante peppers spice up Cabot's mild Monterey Jack cheese. This is a great addition to your nachos or chili recipe. Medium heat...for those who like a little spice in their life. BUY 3 or MORE AND SAVE!! 1. Sprinkle one half of each tortilla with about 2 tablespoons of cheese. Layer turkey breast and apple slices on top, followed by remaining cheese. Fold bare half of each tortilla down over filling, pressing firmly. 2. Coat large skillet with cooking spray or brush with oil. Place over medium-low heat. 3. Add quesadillas to skillet and cook, pressing down with spatula occasionally, until browned on underside, 2 to 3 minutes. Turn over with spatula and cook until browned on second side and cheese is melted, 2 to 3 minutes longer. Cut into wedges and serve. I love this version of pepper jack, I can eat it plain which is saying a lot for me. some pepper jack brands have a very slight pepper taste,and thats fine,but I like to taste the heat,and this one is not shy,but not excessive either.